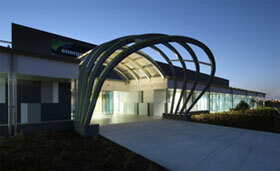 The Energex Distribution Centre, TradeCoast Central, is the first certified project for the Green Building Council of Australia’s Green Star Industrial V1 rating tool. The project includes a large storage warehouse, office space and support spaces. Ecolateral was appointed as the Green Star Accredited Professional to target the delivery of a 4 Green Star Industrial V1 Design rating. Ecolateral worked with the consultant team to provide synergistic advice on the inclusion of practically achievable environmentally sustainable design elements and value managed outcomes. In addition, Ecolateral provided building performance modeling to determine energy efficiency, natural daylight levels, thermal comfort and glare control. Lot 12 at TradeCoast Central is the first, and to date, only project in Australia to successfully be awarded a Green Star Industrial Pilot rating from the Green Building Council of Australia. The project achieved a 4 Star outcome, signifying ‘Best Practice’ design. The project includes a large warehouse with office space and support services. Ecolateral worked closely with the management and design team to provide direction on the most commercially viable and environmentally sustainable design elements. As a result the project successfully delivered a Green Star Industrial Pilot – 4 Star rating for the project. Ecolateral, were part of the successful team appointed to this project. Ecolateral developed and supervised the implementation of an Environmental Design Brief to ensure that sustainability is incorporated into the design and plays a role throughout the whole project, including construction.